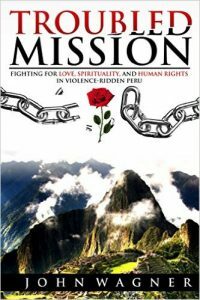 What happens when, after a life-changing study-tour of Peru, a successful US attorney abandons his law practice to volunteer with a religious organization and travel to Peru to fight for human rights in the midst of a culture of violence and terror? Not what he expected. In his sometimes romantic, sometimes terrifying, always inspiring memoir, John Wagner searches for love, spirituality, and the chance to fight against injustice and oppression in a country not his own, while working for a religious organization he could not trust. Wagner lives under a death threat from the fanatical Sendero Luminoso terrorist organization that he must keep secret from his religious community. He develops an on-and-off love affair with Bella, a beautiful but mysterious Peruvian teacher. He faces dramatic betrayals. He accidentally travels into the heart of the drug capital of the world. Day by day, he sees the increasing violence in Peru and overnight, he sees Peru’s president become a dictator, shredding the rule of law. After a terrorist attack in a small town, he confronts Peruvian Army officers head-on to gain access to the scene. Then he must help prepare for burial the bloody, ravaged, body of a campesina woman killed in that attack. In this story, Wagner skillfully interweaves his inner struggles, including coming to grips with a new language, a new culture, a lower station in life, and a new perspective on his native Catholicism. Finally, he stumbles into what would become a landmark human rights case, stopping the Peruvian government from persecuting human rights lawyers. Ultimately, Troubled Mission is the story of human redemption. Many people seek personal change only to find unexpected obstacles. Troubled Mission shows how we can find redemption—or redemption finds us—in so many unexpected ways. John Wagner was a successful lawyer with a prominent U.S. law firm in the 1990s. A frequent adventure and spiritual traveler, his life changed dramatically during a study tour on the history and culture of Peru, including studying Sendero Luminoso, the violent terrorist group. He gave up everything, and risked his career and his life, to join a mission organization to work for human rights in Peru—in the face of a death threat if he did so. In Peru, he deepened his spirituality, worked on a landmark human rights case and fell in love with Bella, a local teacher. After his work in Peru, he returned to the U.S., resumed his legal career, and married Bella. He holds degrees from Western State Colorado University, the University of Chicago, and the University of Wisconsin Law School. An early Baby Boomer, he has been a civil rights and antiwar activist, a disc jockey (loving rock n roll, jazz, and opera), a world traveler, and a motorcyclist. He is now retired from practicing law and lives with Bella in Sacramento, California, near their children and grandchildren. Find out more at www.johnpwagner.com.